Another image for my Train Series of greeting cards. Happy Easter everyone! Here's a preview of what I am currently working on to pitch to art buyers. A series of fold out greeting cards. ! Had a lot of fun working on this series and I hope it will find a buyer who enjoys them as well! Thanks to all who posted on social media, called or texted me birthday wishes! Yesterday was PI Day for most around the world but 3.14 is always cake day for me! Thanks for making it special with all the kind smile producing messages!!! It was a slice! 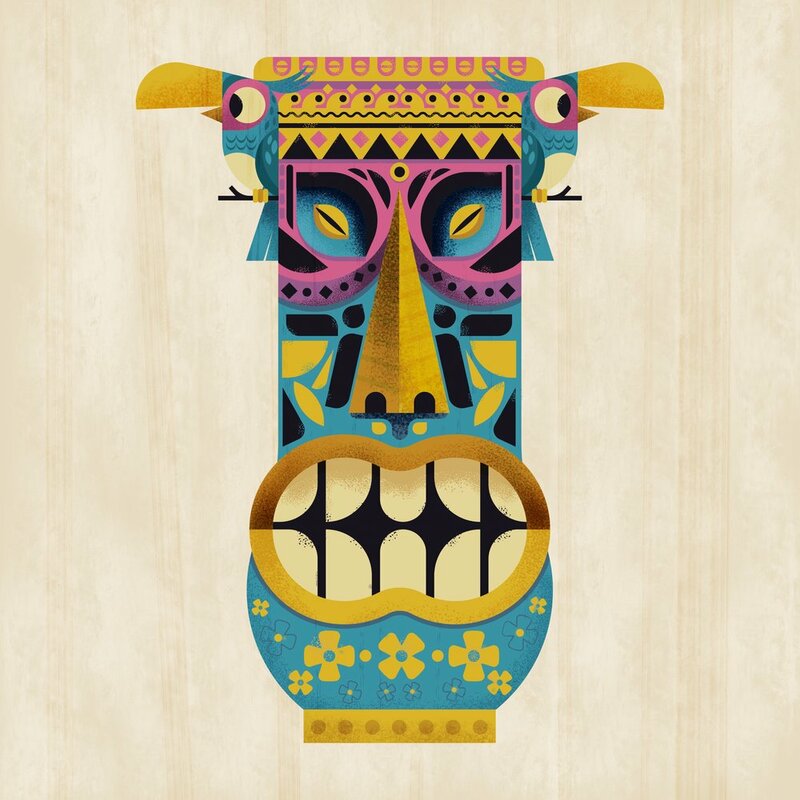 Doing some tiki inspired illustration exploration for an actual tiki mug to be produced this spring. Tho the weather is cold this topic is definitely tropic! Happy to showcase a fun new project I was able to take part in. My rocket into space illustration is part of Series 11 can design for Collective Arts Brewing! It's a great looking collection and I am super proud to be a part of it. Cheers! Fun New Brushes from Retro Supply! Recently, I was lucky enough to test out Retro Supply’s latest brushes called The Dry Brush Pack for Procreate! You can see it in action with this fun Astro-saurus illo I doodled up this weekend. I really dig the new pack a lot! The brushes perfectly add that subtle (and sometimes not so subtle) texturing I love for my illustration work. You can pick up your pack today as it's releasing after noon CT! Read Along Records were Incredible! Very happy to be working with some great projects and people to start the year! Everything from sculptures to apps to greeting cards and three new books! I try and find time to play with some concepts as well. Here is a concept for a book story idea I've been experimenting with. Tony The Tiger is Grrrreat! Wishing all of my online friends and clients a DINO-MITE New Year. To all of you, I wish the very best in 2019! An available Christmas Joy series I designed and illustrated. Pushing some holiday color by placing some bright pinks over those the greens. Hope filled, bright and fun branding for the holidays! A brand new snowman series I illustrated. One of my favorite things to work on is seasonal images for cards and wrapping paper! More snowman experimentation on my iPad Pro in Affinity Designer! Getting more and more comfortable with it. I even imported Retro Supply Co wonderful Retro Wonderland brush set to create these winter themed illustrations!